There’s nothing quite like being out on the water, breeze in your hair and not a care in the world. But does your boat’s seating provide all the comfort and convenience you’d like it to? If you haven’t considered bean bags as the ideal accessory for your aquatic adventures, it might be time to give them a try. Portability – Bean bags are lighter than traditional deck chairs, and can easily be tossed on the top of a smaller boat to save room while fishing or engaging in other non-seated activities. When it comes time to store them, this flexible furniture can be squeezed into small spaces where traditional lounge chairs can’t fit. Softness – The whole purpose of your water-bound outing is to relax. Built-ins aren’t always the most ergonomically friendly, and hard lounge chairs can get uncomfortable after a while. 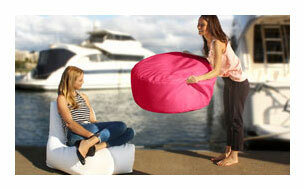 Bean bags have no sharp edges and mould to your body to provide a truly calming and meditative experience. Versatility – Whether you choose an armchair style so you can observe the scenery as you cruise, or a lounger for leisurely sunbathing or napping, there are shapes and styles for all preferences and any size boat. Durability – Bliss Bean Bags are UV-resistant, so they won’t fade in the hot Australian sun, and they’re waterproof to both fresh and salt water, making them ideal for the water sport enthusiast. In addition, they’re easy to clean and stain and abrasion resistant as well. Attractiveness – Choose from virtually endless colour combos, including more than one colour on the same piece. Get them to match your boat’s colours, and for extra flare, have them personalised with your vessel’s name. In addition to all of the benefits of choosing bean bags as additional boat seating for yourself, your guests will be equally as thrilled – in fact they may never want to disembark! Your boat is an investment and, as such, you want only the best in everything you equip her with. Bliss Bean Bags are constructed with care right here in Australia, are built for comfort as well as longevity, and come with a lifetime warranty. We pride ourselves on a passion for a different approach to beautiful, comfortable furniture. If you own and/or operate a charter or rental boat, adding luxuriously comfortable seating options will make a lasting impression on your clients. Our bags can stand up to the wear and tear that your boat’s furniture takes, and will add that memorable touch that sets you apart and keeps people coming back. Choosing bright, fun colours can bring your vessel to life, attracting attention and lending a party-like atmosphere to outings. Bring a soft, sturdy element of surprise to your boat with vibrant, high-quality seating that will turn your day on the water into a heavenly getaway.